In the heart of the New Forest, discover the beautiful Montagu Arms Hotel. The 17th century country house, known for its timeless elegance, exquisite cuisine and exceptional service, proudly holds its newest accolade, ‘Top City and Country Hotel Award 2013’ from the Tea Guild, for an outstanding Afternoon Tea. The Montagu Arms thrives on working to exceptional standards and maintaining excellence, and has striven for three years to meet the strict criteria set out by The Tea Guild and their prestigious awards, commonly referred to as The Oscars of the tea world, to win the coveted award and highest accolade. The award not only recognises the tea that is served but all aspects of the ‘Afternoon Tea’ experience, from hotel décor and staff attitude to the staff’s tea knowledge and the decadent cakes and pastries which accompany it, which all form a part of The Tea Guild’s judging process. The Montagu Arms, which holds a Michelin star with Head Chef Matthew Tomkinson, received a “near perfect score” from the Tea Guild, whose inspectors dined anonymously, in order to uphold the most accurate guest experience, and were looking at every detail, even up to the ‘appropriateness’ of the crockery and the atmosphere at the time. Head of The Tea Guild, Irene Gorman commented: “The Montagu Arms was favoured by the Tea Guild inspectors its delightful surroundings, the mouth-watering selection of sandwiches and the staff’s extensive knowledge of teas” which had been “brewed and served to perfection”. 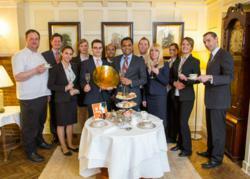 The Montagu Arms Hotel Manager, Sunil Kanjanghat said: “It’s a fantastic honour for us to win this Tea Guild award, our customers demand the very best and we strive at all times to fulfil their expectations. The award- winning Traditional Afternoon Tea includes a large selection of the finest fair trade loose leaf teas and coffees, a selection of traditional finely cut sandwiches, warm freshly-baked scones and home-baked speciality cakes and pastries, not to mention the delicious lashings of clotted cream and homemade preserve to compliment every bite. The Top City & Country Hotel Tea Award is a new award for 2013, introduced to recognise the growing number of Tea Guild members in the category across the United Kingdom, the first award of a specially commissioned glass bowl designed by the world famous glass artist, Adam Aaronson of Aaronson Noon Ltd, given to The Montagu Arms. The Tea Guild, now in its 28th year, was founded by The Tea Council in 1985 in order to ‘recognise and promote tea serving establishments, large and small, in city, town or village’ to increase business and maintain high standards throughout the UK. At the moment Montagu Arms is offering a tea for two break which offers this fantastic traditional afternoon tea, a three course meal in the Michelin Star restaurant and an overnight stay throughout May and June to celebrate and share with guests the latest award. For information on the breaks and offers available at The Montagu Arms Hotel please visit http://www.careysmanor.com/luxury_short_breaks.html or contact the reservations team on 01590 624467. The Montagu Arms is a 4 Star luxury hotel situated in the New Forest, Hampshire. It is also conveniently located within an hour and a half from London, 20 minutes from the centre of Southampton and with the rest of Hampshire. The Montagu Arms boasts a Michelin Star restaurant, three AA Rosettes and award winning Afternoon tea. The hotel is situated a short journey from its sister hotel - Careys Manor. Guests staying at The Montagu Arms Hotel site meaning clients are able to take advantage of Careys Manor’s leisure facilities, which includes a full-service spa.